“ Beer is a far more dangerous enemy to Germany than all the armies of France.”—Von Moltke. “Alcohol is a waste-product in the activity of the yeast plant.”1— C. F. Hodge, Ph.D., Professor of Physiology, Clark University. Water ........ 90 per cent. The different alcoholic beverages may be classified into three groups : (1) beers ; (2) wines ; (3) spirits or distilled liquors. 1 The stronger beers go up to 10 per cent, see evidence before the Departmental Committee on Beer Materials, 1899. 24 ALCOHOL AND THE HUMAN BODY chap. “cranberry,” “orange,” “gooseberry,” or “rhubarb” wine, between 5 and 12 per cent of alcohol is found. 3. Spirits.—The liquids of the third class—brandy, whisky, and other spirits—contain 40 to 56 per cent of alcohol. Beer . . . . . . . 4 to 5 per cent (by weight). Methylated Spirit1 . . . . . . 90 ,, (by volume). It must be clearly understood that, in all the beverages above mentioned, alcohol is present—the amount being only a matter of proportion. In a pint of ale there are two table-spoonfuls of alcohol; while in a pint of wine there are about six tablespoonfuls, and a pint of brandy consists of about equal parts of alcohol and water. Alcohol may be prepared in a number of ways, but all that we need remember for practical purposes is that it is obtained as a rule from the fermentation of sugars. Starchy materials are also used, these starchy materials being utilised in order to provide the sugar needed for fermentation. 1 Methylated Spirit, which is largely used for burning in spirit lamps, and in the preparation of different kinds of wood ­polish, consists of about 90 per cent of ethyl alcohol and 10 per cent crude wood spirit (impure methyl alcohol), together with a small quantity of naphtha added for the purpose of rendering the spirit undrinkable. becomes sour, butter turns rancid, fruit decomposes, and beer is formed from malt. In all these cases a chemical change takes place, and we have to consider how this change is caused. When milk is left standing exposed to the air, it turns sour without anything apparently being added. But the air is full of minute forms of vegetable life—“ micro-organisms “—which, although so small that they can only be seen with a powerful microscope, are extremely active. They produce something which is called a ferment or “ enzyme,” and it is due to this ferment that the chemical change called fermentation takes place. Therefore, in order to prevent milk or various other substances from fermenting, it must be kept away from the air or anything containing these micro-organisms. The fermentation by which alcohol is produced is chiefly brought about by an air­borne micro-organism called the yeast plant, growing in the presence of sugars, as will be explained later on. This yeast plant produces a ferment which acts especially on certain sorts of sugar, splitting them up into alcohol and carbon dioxide (carbonic acid) gas. Fermentable sugars, i.e. sugars capable of being thus split up, are found in many situations and many substances, for instance, in grapes, in apples, and in barley-grains at a certain period of their growth. In the case of grapes the micro-organisms which produce the right kind of ferment to turn the grape sugar into alcohol, gather from the air and collect upon the outside of the grape. While there, they cannot attack the juice,—but as soon as the grapes are crushed and squeezed into a pulp and the skins are broken, the micro-organisms begin to grow and increase very rapidly, at the same time producing their ferment, which splits up the sugar in the grapes into alcohol and carbon dioxide gas, bubbles of which escape freely. We have mentioned the sugar which exists in grapes ; and we must now describe another kind of sugar which is found in sprouting barley, and can also be turned into alcohol, provided that there be present the ferment which is produced by the micro-organism called yeast. Fig. 4.—Yeast cells in active growth and budding. 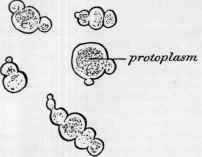 The protoplasmic centre of each segment is shown as a granular material. present in the solu­ tion reaches 13 per cent, the growth and multiplication of the yeast ceases, being checked and finally arrested by the presence of alcohol in the surrounding fluid. Thus the alcohol is not a source of either energy or food to the yeast plant, but on the contrary is injurious to it and stops its growth. This remark­ able fact is in accordance with recent “findings” of science as to the inhibiting effect of alcohol upon plant growth, to which we shall refer in the next chapter. The most interesting part of the processes involved in the preparation of alcohol is undoubtedly the method adopted in order to obtain large supplies of cheap sugary liquids in which yeast has the power of growing and therefore of converting them into alcohol. into a soluble form of sugar. 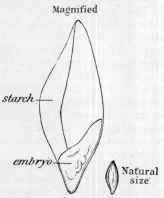 This is needed as the food-supply for the germinating plant, and if undisturbed the little barley germ thrives for some time on this sugar, until it is vigorous enough to send out rootlets into the soil and thus become an independent plant capable of growth and development. suddenly checking the process are produced. The next process consists in grinding and breaking up these sprouting grains of malt, so that all the rest of the starch can be acted on by the diastase, which is so powerful that it is able to convert into sugar a certain amount of further additional starch if this be added to the solution. The resultant liquid is called “ sweet-wort,” and from this the residual grains are now separated. After being dried they are used as food for cattle. When yeast is added to the sweet-wort, the soluble sugar it contains is rapidly converted into alcohol, carbonic acid gas, and water, as already explained on p. 25. 28 ALCOHOL AND THE HUMAN BODY chap. tion of “spirit.” On the other hand, if beer is required, certain other preliminary processes are carried out,—for example, such things as “hops,” or one of its substitutes, are boiled with the “ sweet­ wort “ before fermentation is set up. The practical details as to the manufacture of these beverages are very many, and would be out of place here; the one point of general interest being the simple fact that beer is prepared from the fermentation of malt grain, but also in very large quantity from other less desirable substances, and that to this solution other materials, for various reasons, are frequently added. The exact proportions of these and the chemical processes through which they are passed are secrets known to the trade—but it is notorious that in the manufacture of beer as carried on to­day in England, malt substitutes, hop substitutes, and various chemicals for preserving the beer are frequently used. (1) That the samples examined showed the presence of arsenic beyond the limit recommended by the Royal Com­ mission on Arsenical Poisoning ; (2) the presence of copper ; (3) the presence of quillaia bark or extract; or (4) that there were alcoholic flavouring essences. 1 Minutes of evidence taken before the Departmental Committee on Beer Materials, 1899, p. 381.
molasses, raw sugar, cane sugar, honey, viscosoline, dextrine, malto-dextrine, black malt sugar, saccharin. Saccharin (coal-tar product) is not allowed : it is strictly forbidden. Hops and its Substitutes Hops, quassia, Colombo root, camomiles, hop substitutes. Chemicals Vitriol, salt, bisulphite of lime, salicylic acid,1 magnesia, tannin, sulphuric acid, chalk. Colouring Matters Colouring, caramel, caramelised dextro-maltose, dextrinous caramel. Clarifying Matters Finings, isinglass, fishy matter (sole skins). Sundry and Stimulating Liquorice, grains of Paradise, Guinea pepper, Coceulus indicus. Cocculus indicus is also not permitted to be used. The incessantly repeated efforts of some members of Parlia­ ment to obtain legislative power to stop this method of brewing from refuse and other substances have all failed in view of the influence of the drink traders. 1 “ It appears to be a common custom to preserve ale and beer by the addition of salicylic acid. The use of this drug for this purpose is every­ where recognised as harmful and unjustifiable.”—Report of the Massachusetts Board of Health, 1894.
extractives and salts, 4 to 5 oz. maltose, 2 to 3 oz. albuminoids, ½ to ¾ oz. 30 ALCOHOL AND THE HUMAN BODY chap. is, economically speaking, a matter of great waste, and so long as England contains human beings in need of cheap food, it is a waste that should be strongly discouraged by the nation. Thus far we have dealt only with the conversion of sugary liquids into alcohol, and have shown that where the alcohol present reaches 13 per cent no further alcohol can be formed by the yeast cells. Therefore, in order to obtain alcohol of a strength more potent than 13 per cent, another process known as “ distillation” has to be followed. The principle is simple, i.e. that of heating a fermented liquid so that the alcohol (the lightest portion) is driven off in the form of vapour, most of the water being left behind. This vapour is collected and condensed again to the liquid condition by means of passing it through a long coil or “distiller,” which is cooled by a water jacket. At first this “ distillate ” always contains some water in addition to the alcohol, but, if needs be, it is quite easy to repeat the process several times, and in this way to obtain pure alcohol practically free from water. Malt whisky is prepared from malt and yeast by fermenta­ tion as described,—the liquid containing alcohol being finally run into a “still” and “distilled,” forming raw whisky. For making such distilled liquors as whisky, gin, or “ Schnapps,” the starch is obtained from rye, maize, or oats, or from potatoes or beet­root. In the preparation of “ patent “ spirit various artificial means are used. For instance, alcohol may even be obtained from sawdust, which is first converted by means of acids into a fermentable sugar, which is then fermented. In addition to the recognised “still” and patent spirit of commerce, there are on the market certain cheap spirits artificially concocted from alcohol, prepared from inferior material and carelessly purified, and containing sometimes, besides the alcohol, other ingredients of a harmful nature. The Massachusetts Board of Health reports (1894) that tannic acid was found in excess in 5 out of 37 samples of whisky. Fusel oil in noxious amount is occasionally to be found, and it is also rarely present to a distinctly appreciable extent in beer. Rum is made from a mixture containing molasses, which is fermented and then distilled. Gin is made in practically the same way as whisky, but the distilled liquor is in addition re­distilled with juniper berries, turpentine, coriander seed, or a variety of other flavouring materials. Since the brilliant discovery of Pasteur, whereby the de­ struction of the vines was stopped, the demand for these 1 See Journal of British Medical Association, December 26, 1903. 32 ALCOHOL AND THE HUMAN BODY chap. made-up wines has been less urgent; but, nevertheless, we need to be on the alert as regards their existence, because some of them are more intoxicating than ordinary wines, containing as they do a somewhat larger percentage of alcohol than exists in wine prepared from grape juice alone. The ancients appear to have used as a drink the fresh juice of the grape which had not been put through the process of fermentation. “ And Pharaoh’s cup was in my hand ; and I took the grapes, and pressed them into Pharaoh’s cup ” (Gen. xl. 11). This quotation with its context seems to show that the juice of fresh grapes was frequently enjoyed in the unfermented state, and proves therefore that when the word “ wine ” is used by ancient writers it does not necessarily refer to an alcoholic beverage, although undoubtedly fermented wines were also in use. In the present day unfermented wine is prepared on a large scale in Switzerland, Australia, and other places, according to one or more simple methods. Method of preparing Unfermented Wine. — The grape juice, before it has had time to ferment, is heated to a certain point and then placed in sterilised vessels, which are sealed so that no micro-organism can enter. Hence, as no fermentation occurs, alcohol is not formed. sulphurous, benzoic, and cinnamic acids. This addition of alcohol to liquids which are nominally non-alcoholic takes place to no small extent in the preparation of patent medicines and drinks. It very seriously adds to the amount of alcohol consumed by the nation, an addition which various Governments are beginning to realise and taking steps to prevent.